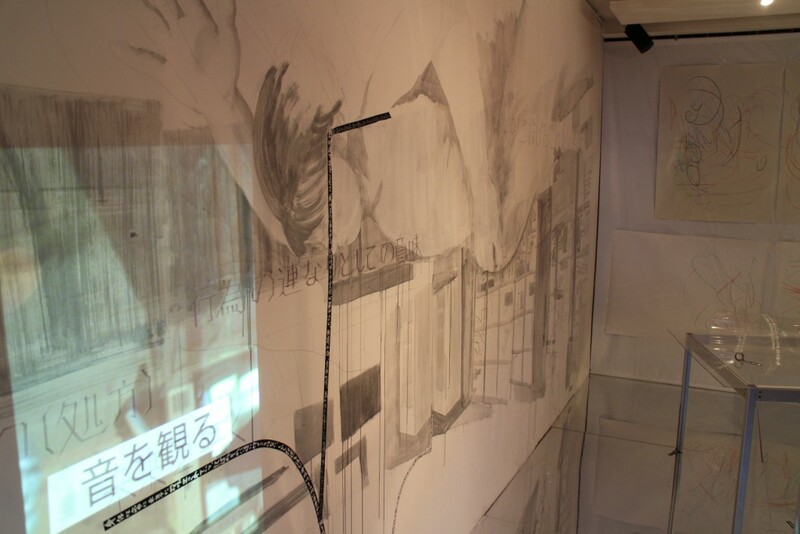 A work with Ryuichi Tani in a one-month open cooperative project and exhibition. Memory has different faces ranging from working memory, which is short-term memory, to various memory levels. I assumed that conscious has different faces too. We experimented to schematize the relationship between consciousness and instinct. First, we connected the camera with the projector and projected the image currently shot on the camera on a white wall. The camera and the projector were then put together back-to-back, and were on a turntable, circling at a constant speed. We had a huge window and an entrance that showed views of outside, so we set the camera in the window and projected the picture on the opposite white wall. Next, we wrote letters on the white wall and then keywords that had meanings opposite of the initial words on the windows and transparent plastic boards to be able to shoot the key words by camera. Keywords were mapped on the letters on the white wall with a projection by shooting them with a camera. We intended to write in the theme of acting and vision. On the white wall, we additionally traced the landscape outside with India ink. The other day, we recorded a dance with a female dancer with this camera system. On the last day, we erased the wall paintings with white except for a small part.